The EE department at IIT Bombay has been active in teaching and research since its inception in 1957. Currently, about 45 faculty members are engaged in research in the areas of Communication and Signal Processing, Control and Computing, Power Electronics and Power Systems, Microelectronics and VLSI design, and Electronic Systems. The department has academic programmes with about 320 undergraduate and 200 postgraduate students. The department is equipped with the latest experimental and computational facilities for taking up R & D and consultancy activities in various fields. Since its inception in 1985, Center for Technology Alternatives for Rural Areas (CTARA) at IIT-Bombay is involved in design and development of technologies relevant to rural areas. The current working areas of CTARA include farm machinery, food processing, low cost housing, renewable energy, water management, rural industry etc. The CTARA carries out its programmes through full time research assistants, visiting experts and associated faculty members from different disciplines at IIT. Presently the undergraduate and graduate students from other engineering or applied science disciplines participate in CTARA activities as a part of thesis or project requirement. Power densities encountered in microelectronic equipment have increased tremendously due to progress in semiconductor technology. Integrated circuits in the near future are expected to have such large power densities, that traditional air cooling will no longer be sufficient to cool them. The thermal design goal is to limit the magnitude of chip temperature rise above ambient temperature in order to ensure satisfactory electrical circuit operation and reliability. For optimal performance and lifetime of these devices, more efficient cooling techniques will be required. Microprocessors, in the near future, are expected to have a requirement for removing a very large amount of heat from a small area. Conventional air cooled heat sinks will no longer be sufficient to cater to this requirement. Heat transfer to fluids flowing through microchannels is being looked upon as a promising solution to this problem. Hence, a thorough understanding of heat transfer in microchannels has become a necessity. Our knowledge of macro-scale heat transfer cannot in general be directly applied to heat transfer in microchannels. Experimentation and modeling studies are being carried out by various researchers around the world to obtain a better understand of micro-scale heat transfer. There is a need for the development of better models and correlations to explain experimental observations related to microflows. Annular flow is a flow pattern observed by several researchers in microchannels. Annular flow model has been studied, modified and extended for obtaining the pressure distribution and for handling non-uniform heating along the microchannel. A very promising solution for cooling microchips is by heat transfer to single phase and boiling fluids flowing through microchannels. To cool a small device having a large power density, we require a very large heat transfer coefficient between the device and the cooling fluid. From our experience with macro-scale flows, we know that in a fully developed laminar flow of a liquid through a tube with uniform surface heat flux, the Nusselt number is a constant. This implies that, the heat transfer coefficient is inversely proportional to the hydraulic diameter. Thus, the heat transfer coefficient is expected to have a very large value when the hydraulic diameter of the channel is in the range of micrometers. However, such an increase will come at the cost of a significant increase in pressure drop across the channel. It has been claimed by Goodson et al. that boiling heat transfer in microchannels requires less pumping power than single-phase liquid convection to achieve a given heat sink thermal resistance. Also, using a two phase flow helps to eliminate large temperature variations within the device. Unless a very large flow rate is used, this is difficult to achieve using a single phase flow. A large flow rate will invariably lead to a large pressure drop which requires more pumping power, may generate more noise and requires bulkier packaging. Annular flow is a regime that has been observed by many researchers in microchannels. Qu and Mudawar  have attempted a model of annular flow that is described in brief below. In an annular flow, the vapor phase flows along the center of the channel and is surrounded by a thin film of liquid along the channel walls. The vapor phase, thus, forms a continuous vapor core in the center of the channel. 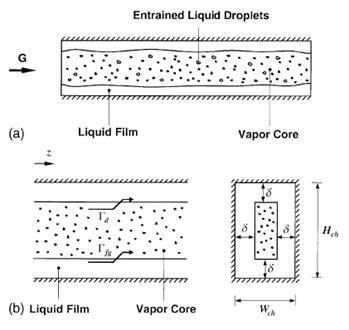 Liquid droplets are entrained in the vapor core. Mass is continuously exchanged between the liquid film and vapor core in the direction of the fluid flow. Figure 3.1 is a representation of the annular flow in a microchannel. The model has been constructed by means of equations for mass conservation and momentum conservation in the liquid film and the vapor core. These mass and momentum conservation equations have been solved numerically and the predictions have been compared with experimental data. Good agreement has been claimed between experimental data and model predictions. When there is a very high heat input into the channel, the fluid film may completely evaporate. This condition is known as dryout. The annular flow equations are no longer valid beyond this point. Hence, appropriate changes must be incorporated in the program to identify this scenario. Channels are made with glass and silicon using microfabrication techniques. Channel masks are printed in positive with a high-resolution printer on transparent paper for lithography. Photoresist is spin coated on a silicon wafer. The wafer is then exposed to UV light through the mask. Channels are etched at different depths using Deep Reactive Ion Etching (DRIE). The sealing is made with Pyrex glass using anodic bonding, providing optical access for flow analysis. 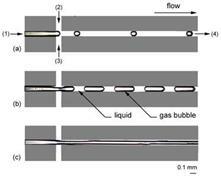 Properly introducing gas bubbles is an important step in producing a two-phase flow pattern. We micromachined an effective small mixing section on-chip. Well-defined bubbles in a wide range of sizes can be produced as a function of liquid and gas flow rates. Because of the square channel symmetries, bubbles flow “naturally” in the center of the channel. The cross-shaped was chosen to produce a steady uniform flow. The minimal size of bubbles is about the size of the channel. In these experiments, this mixing system is used as an effective way to produce two-phase flows in microdevices. Lithography is typically the transfer of a pattern to photosensitive material by selective exposure to a radiation source such as light. A photosensitive material is a material that experiences in its physical properties when exposed to a radiation source. If we selectively expose a photosensitive material to radiation (e.g. 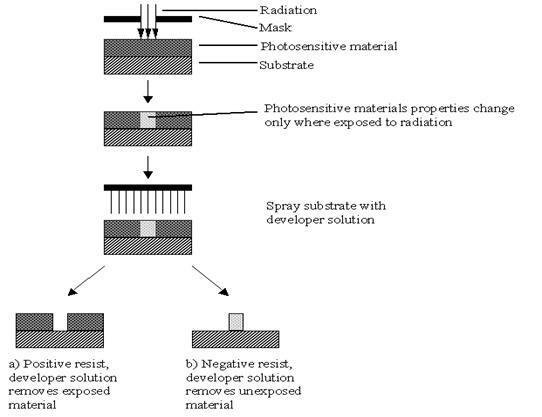 by masking some of the radiation) the pattern of the radiation on the material is transferred to the material exposed, as the properties of the exposed and unexposed regions differ (as shown in fig 1). 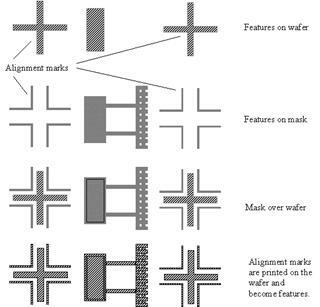 Figure 3: a) Pattern transfer from patterned photoresist to underlying layer by etching, b) Pattern transfer from patterned photoresist to overlying layer by lift-off. Figure 6: Poor alignment mark design for a DRIE through the wafer etch (cross hair is released and lost). Photolithography or optical lithography is a process used in semiconductor device fabrication to transfer a pattern from a photomask (also called reticle) to the surface of a substrate. Often crystalline silicon in the form of a wafer is used as a choice of substrate, although there are several other options including, but not limited to, glass, sapphire, and metal. Photolithography (also referred to as "microlithography" or "nanolithography") bears a similarity to the conventional lithography used in printing and shares some of the fundamental principles of photographic processes. and various other chemical treatments (thinning agents, edge-bead removal etc.) in repeated steps on an initially flat substrate. A part of a typical silicon lithography procedure would begin by depositing a layer of conductive metal several nanometers thick on the substrate. A layer of photoresist -- a chemical that hardens when exposed to light (often ultraviolet) -- is applied on top of the metal layer. The photoresist is selectively "hardened" by illuminating it in specific places. For this purpose a transparent plate with patterns printed on it, called a photomask or shadowmask, is used together with an illumination source to shine light on specific parts of the photoresist. Some photoresists work well under broadband ultraviolet light, whereas others are designed to be sensitive at specific frequencies to ultraviolet light. It is also possible to use other types of resist that are sensitive to X-Rays and others that are sensitive to electron-beam exposure. A spinner used to apply photoresist to the surface of a silicon wafer. Generally most types of photoresist will be available as either "positive" or "negative". 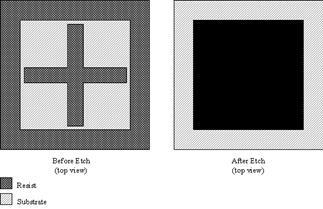 With positive resists the area that you can see (masked) on the photomask is the area that you will see upon developing of the photoresist. With negative resists it is the inverse, so any area that is exposed will remain, whilst any areas that are not exposed will be developed. After developing, the resist is usually hard-baked before subjecting to a chemical etching stage which will remove the metal underneath. Finally, the hardened photoresist is etched using a different chemical treatment, and all that remains is a layer of metal in the same shape as the mask (or the inverse if negative resist has been used). Lithography is used because it affords exact control over the shape and size of the objects it creates, and because it can create patterns over an entire surface simultaneously. Its main disadvantages are that it requires a substrate to start with, it is not very effective at creating shapes that are not flat, and it can require extremely clean operating condition. · Dehydration bake - dehydrate the wafer to aid resist adhesion. 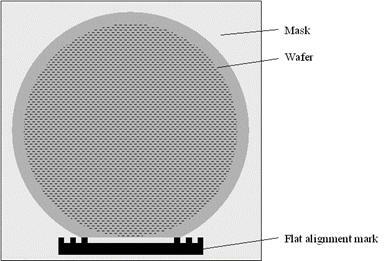 · HMDS prime - coating of wafer surface with adhesion promoter. Not necessary for all surfaces. · Resist spin/spray - coating of the wafer with resist either by spinning or spraying. Typically desire a uniform coat. · Soft bake - drive off some of the solvent in the resist, may result in a significant loss of mass of resist (and thickness). Makes resist more viscous. 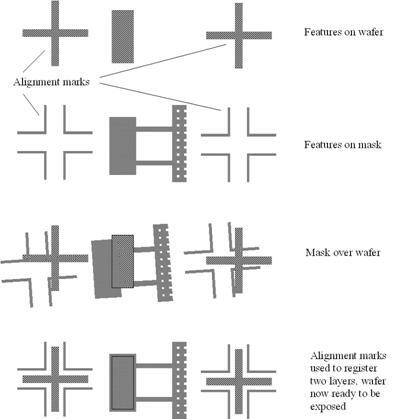 · Alignment - align pattern on mask to features on wafers. · Exposure - projection of mask image on resist to cause selective chemical property change. · Post exposure bake - baking of resist to drive off further solvent content. Makes resist more resistant to etchants (other than developer). · Develop - selective removal of resist after exposure (exposed resist if resist is positive, unexposed resist if resist is positive). Usually a wet process (although dry processes exist). · Hard bake - drive off most of the remaining solvent from the resist. Etching is a method of printmaking in which the image is incised into the surface of a metal plate using an acid. Isotropic etchants attack the material being etched at the same rate in all directions. Anisotropic etchants attack the silicon wafer at different rates in different directions. On wafers the most used etchant is KOH. Anisotropic etching does not cause undercutting, and is preferred in applications where straight side walls are essential. 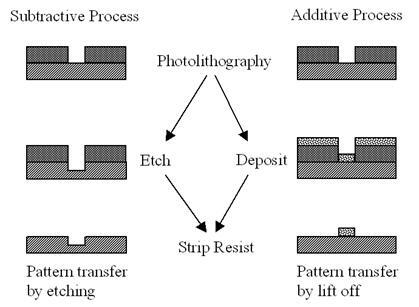 Anisotropic etching requires a substrate with a well defined crystalline structure such as silicon. The etch is directional and proceeds along the exposed plane in the crystal lattice. As atoms are removed from the crystal lattice, different planes are exposed to the etchant. Since the density of atoms on the planes varies, the etch rate varies significantly. 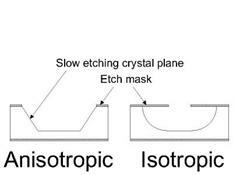 Figure 1: Difference between anisotropic and isotropic wet etching. In silicon, a popular anisotropic wet etch substrate, the initial (0 degree) surface is called 100 and etches a hundred times faster than the 110 (45 degree) and 111 (54 degree) surfaces. This results in a consistent wedge shaped etch pattern. 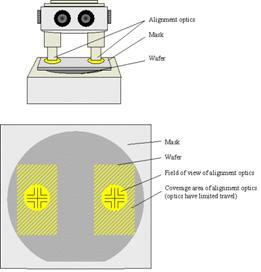 Wet etching is also used for the characterization of the quality of a wafer. The etch pit density is a measure for the number of dislocations per area. Two phase heat transfer to fluids flowing through microchannels is a promising solution to the problem of cooling integrated circuits with very high power densities. Macro-scale results cannot be directly applied to microchannels. Onset of annular flow and dryout may be significantly affected by the location of a hotspot along the microchannel. In a practical cooling device having a set of parallel microchannels with common inlet and exit manifolds, the flow will distribute itself between the channels depending on the heat input to each of the channels. In certain cases, it is not possible to have equal pressures across two channels without encountering dryout in one of them. Heat input and subcooling at the inlet are some of the parameters that can affect the pressure drop across the microchannels and two phase heat transfer coefficient. G. Hetsroni, Z. Mosyak, G. Ziskind, A uniform temperature heat sink for cooling of electronic devices, Int. J. Heat Mass Transfer 45 (2002) 3275-3286. L. Zhang, J. Koo, L.Jiang, M. Ashegi, K. Goodson, J. Santiago, T. Kenny, Measurement and modeling of two-phase flow in microchannels with nearly constant heat flux boundary condition, J. Microelectromech. Syst. 11 (2002) 12-19. W. Qu, I. Mudawar, Flow boiling heat transfer in two-phase microchannel heat sinks—I. Experimental investigation and assessment of correlation methods, Int. J. Heat Mass Transfer 46 (2003) 2755-2771. P. Lee, H. Li, F. Tseng, C. Pan, Nucleate boiling Heat transfer in Silicon-based microchannels, Proceedings of ASME summer heat transfer conference, 2003, pp.1-4. W. Qu, I. Mudawar, Flow boiling heat transfer in two-phase microchannel heat sinks—II. Annular two-phase flow model, Int. J. Heat Mass Transfer 46 (2003) 2773-2784. S. Kandalikar, Microchannels and Minichannels - History, terminology, classification and current research needs, Proceedings of First International Conference on Microchannels and Minichannels, 2003, pp. 1-6.